Can we stop using these words? God, it’s like those games that prompt you into a dialogue list when there is only every one option to choose from. I always found that to be incredibly stupid. Oblivion does this quite frequently. I always wondered why they bothered changing it to the ‘dialogue option’ model when they already had the click-a-word system from Morrowind. The click-a-word system was oddly satisfying. I had forgotten about it, but I went back and played some Morrowind a few weeks ago. It was just as awesome as I remember it being. Unless I’m mistaken, I think the click-a-word system exists as a matter of necessity in those games? Your character never speaks of his/her own accord, so you always have to select a menu option to progress your side of the conversation, even if there’s only one possible response. I much prefer the Mass Effect system, where Shepard frequently chimes in of her own accord, and you only get a dialog wheel when there’s an actual choice to be made. Harbour Master, I know you’re reading this. You really need to play Mass Effect. I’m not reading this Veret. I’m not here. I don’t even exist. I don’t exist until I’ve read Kent’s words first. I thought this was going to be about the illusion of control (the first line fooled me) but, no, we get something quite tangential. What I find interesting is how the game just didn’t need a player to rip through the dialogue. Not having played a Persona before, I assume these are actually games. So the future is here and games play themselves. Eventually all the lazy player will do is change the batteries. And then We Will Become The Battery – and we all know which well-known film series will become reality. The Japanese have been making these odd, barely interactive, psudo-games for ages. They’re just an electronic presentation of a trashy novel or soap opera, basically. Man, what a bizarre series Shin Megami Tensei is. I tried to get into Persona 2 once, but it was so frontloaded with dull text that I gave up before fighting a single demon. It’s funny that the illusion that the game cares one whit about the player’s presence can so easily be conjured up with that simple button press. The game is going to plow through the same forty pages of script whatever you do, but that “x” prompt is just comforting enough to allow you to ignore that. Pushing a button is a powerfully satisfying thing. There seems to be a growing trend in Japan of giving players the option, if they so choose, of letting a game play itself. Devil May Cry 4 and Bayonetta both came with Auto-Combo options which if you turned them on meant that you could press the X button and the character would just do whatever they felt like and beat up on all the enemies. I always wondered if these things technically made the game more simple or more complex. All the underlying systems are still there, dutifully being simulated, but your part has been short-circuited. When you sit back and watch it, it’s a swirl of impressive motion, which is meaningless in context but is still encoded with all the same meaning that you would discover if you were the one in charge. Auto modes bring those games very close to where Persona starts off, with just one verb: a kingly “Proceed.” Maybe that’s all the player really needs. The jester is going to do his dance without your help, but by deferring to your order before it starts the game allows you to take ownership of it. Interestingly enough, the text in Bioware games is almost humble, or maybe even tentative: you can cruise through all of mass effect without reading the codex thing once. Same goes for large swathes of dragon age. These games hide a lot of the text away, and just have to hope that we care enough to read it–but the writing is so good that people go after it anyway. Much better, I think, than what I’ve seen in Persona (though I’ve only watched those giant bomb gameplay videos, and then not very many of them.) Though it might not be entirely fair to criticize the writing in japanese games, since the best kinds of translations only happen when the translator is confident enough to be as much of an artist as the original author was. I think it’s kind of an apples-to-wrenches comparison between Bioware’s RPGs and the Persona games, since I love them both but for such different reasons. 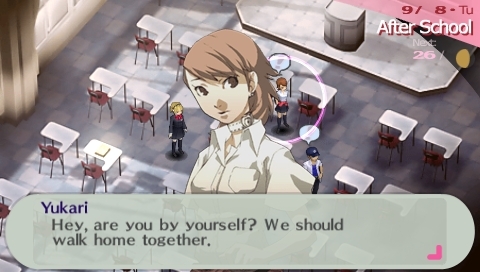 The Persona games work on me in the way that a good TV show does – any one episode of a show might not hold up as great writing on its own, but if the cast is strongly characterized and likable then you grow attached to them over time and eventually it becomes more than just the sum of its parts. 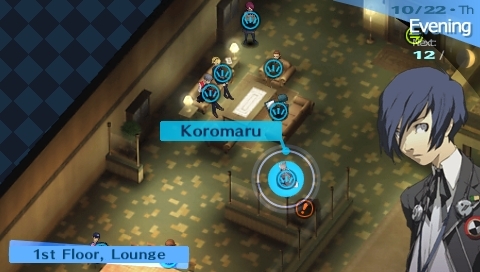 I think part of what helps foster that kind of character connection in Persona is the more mundane settings. Bioware’s games go for the epic sweep of history thing, where you are reading codexes full of backstory and learning all about the politics of great nations and taking part in wars and apocalypses, while Persona games essentially take the horror movie model of the supernatural invading familiar places and do a lot of interesting playing around with the balance between your normal life and the monster-fighting RPG part. I guess I turn to the two types of game for two really different reasons. At the end of a Bioware RPG, I feel like I just went on this huge journey, became a hero, saved this really strange universe and became a part of history. At the end of a Persona game, I feel like I just finished a really crazy year of school, met some people who I like, maybe solved a mystery, and now it’s time to get on with my life. They’re very different kinds of stories that scratch some very different itches, but I like em both. Final Fantasy 12, for all its myriad problems, takes a similarly unintrusive approach to text. The game proper is pretty economical with its story bits, but just about every new enemy and location you encounter will unlock 2+ pages of supplemental text in your fantasy-codex. It’s all world-building stuff, and it’s almost universally more interesting than the main narrative thread. It’s clear that some talented translators were given free reign to do whatever they wanted with it. Speaking of games that play themselves, what bothered me about FFXII wasn’t the text, it was the combat. I had my gambits set up so that I didn’t have to do anything at all. I agree with Switchbreak. Persona games and Bioware games are totally different from one another, and there is A PLACE IN MY HEART for each of them.